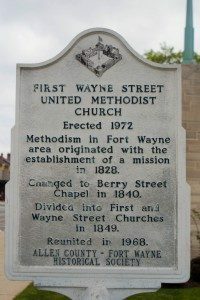 The roots of First Wayne Street United Methodist Church are deep and firmly planted in the early most history of Fort Wayne, as faith’s development among the early pioneers kept pace with Fort Wayne’s growth from settlement to town to city. In true Wesleyan tradition-first came the class and society, then the circuit, and lastly, the organized church. The first Methodist family reported to have arrived in Fort Wayne was that of Joseph Holman, who arrived in 1823. Mr. Holman had been given charge of the United States General Land Office. A year later a brother of Joseph, Rev. James Holman, a licensed Methodist preacher, arrived. Rev. James Holman lived in a log cabin and farmed on a parcel of ground located in that part of the settlement then known as Nebraska, on the north bank of the St. Mary’s River. In this log cabin, Rev. James Holman preached to the settlers of the community every Sunday. The available records of early Methodism in Fort Wayne are not entirely in agreement as to how and when the first mission was established. This is in part due to the fact that the Indiana Conference was not organized until 1832. While Fort Wayne was officially under the control of the Illinois Conference between 1824 and 1832, the Ohio Conference was also involved in Methodism’s early development in Indiana. At the annual meeting of the Ohio Conference, held at Steubenville in August, 1818, Allen Wiley was appointed to the Whitewater Charge. Allen Wiley became a prominent and influential member of the Ohio and Illinois Conferences. He was given his first appointment as a presiding elder by the Illinois Conference in 1828. This appointment was to the Madison District, which included the former Whitewater Circuit, and extended north to include Fort Wayne. The Fort Wayne Mission was organized in 1828, as Fort Wayne Methodists came under Allen Wiley’s supervision as presiding elder. However, there is no known record of appointments for the years 1828-29. On October 6, 1830, the Illinois Conference in the annual session approved the following: “On motion, resolved that Fort Wayne and its vicinity be, and same is hereby, constituted a station to be denominated the Fort Wayne Mission, and that it be attached to the Madison District.” Nehemiah B. Griffith was appointed the pastor. The growing congregation shared various meeting places-schoolhouses, a carpenter’s shop, a cabinet shop, and the old Court House-as prelude to its own first church building. A Historical Record by Alfred S. Johns, written in 1901, records that during the pastorate of James Harrison, who was appointed in 1835 for one year, an attempt was made to build a church on the south side of West Main Street, between Webster and Ewing Streets. A frame structure was partially completed but came to a standstill for lack of funds. Later, a roof was added, but again the money ran short, and the project was finally abandoned. A small church building, The Berry Street Chapel of the Methodist Episcopal Church, was erected in 1840 at the corner of Harrison and West Berry Streets-the same year Fort Wayne was incorporated as a city. Burgeoning growth resulted in the congregation being divided by the Annual Conference in 1849, with all members residing west of Harrison Street forming a new congregation. The newly organized congregation was first known as West Charge but later changed its name to Wayne Street Methodist Episcopal Church. The congregation first met in the chapel of the Fort Wayne Female College established by the Methodist Conference in 1846. It was located at the end of Wayne Street, facing College Street. In 1852, as young men were admitted to the college, it was thereafter commonly known as the Methodist College. In later years, the college reorganized and moved to Upland, Indiana, where it became Taylor University. The Wayne Street Methodist Episcopal Church built its first building, 35 by 50 feet in size, on two lots on the southwest corner of Wayne and Broadway Streets in 1850. In 1871 a new brick building was built on the site of the old frame church and the first organ was installed in the same year. 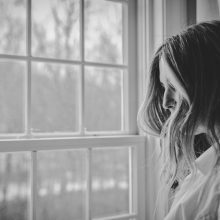 It had to be pumped by hand by the janitor, concealed behind a curtain. 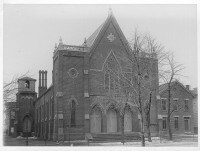 In 1896, the church was remodeled and enlarged. “The Berry Street Chapel of the Methodist Episcopal Church” changed to “Berry Street Methodist Episcopal Church” in 1851. In 1858, the need for a larger church became apparent. Subscription lists were passed and an architect was employed, but progress was slow, and it was not until 1864 that the new church building was completed. 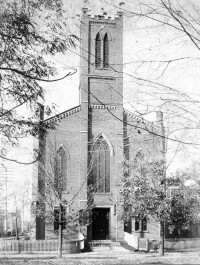 Continued growth led to the Berry Street Methodist Episcopal Church congregation relocating to the corner of Wayne and Lafayette Streets with the laying of the First Methodist Episcopal Church cornerstone in 1902. 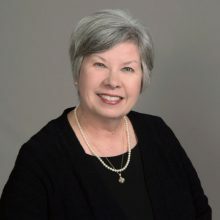 Following the Uniting Conference in 1939, the word “Episcopal” was dropped, and following the union with the Evangelical-United Brethren Church in 1968, the corporate name became, First United Methodist Church. In 1954, new facilities, Wesley Hall and Gettle Memorial Chapel, were added. The First and Wayne Street congregations reunited on Sunday, June 23, 1968, in an inspiring service. On that Sunday, worship services began at 10:00 a.m. in the separate churches. After a short opening, each congregation left its church home to march to meet the other congregation. The First Methodist Church members marched west on Wayne Street to Harrison Street, where the members of Wayne Street Methodist Church, coming east on Wayne Street, met them. Then the united congregation moved north on Harrison to the Van Orman Hotel-located on the northwest corner of Berry and Harrison Streets-the very site at which the Berry Street Methodist Episcopal Church once stood. The sermon for this Union Sunday was preached by Bishop Richard Raines as one of his last official acts before retirement. The ballroom of the Van Orman Hotel was filled to overflowing by members, who listened with both hope and humility to the bishop’s statement that these two congregations were setting a historic precedent that would serve as an example for other congregations over the whole country. 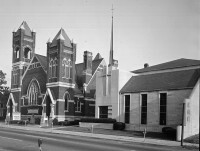 The reunited congregation worshiped from 1968-1972 in the Wayne Street United Methodist Sanctuary, while a new First Wayne Street United Methodist Church Sanctuary was planned and built on Wayne Street frontage just west of the First United Methodist Church’s Wesley Hall and Gettle Chapel. 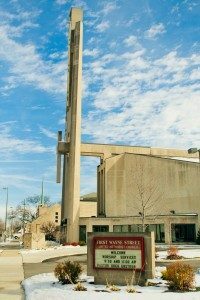 On February 4, 1973, the First Wayne Street Congregation met at 9:30 a.m. at the Wayne Street United Methodist Church site. Here a short service of farewell was held. Then, led by a torchbearer, who carried the light from the altar candles of the old church to light the new, the pastors, choir, and congregation marched to 300 East Wayne Street for the first service in the First Wayne Street United Methodist Church. Bishop Ralph T. Alton, Resident Bishop of the Indiana Area of The United Methodist Church, led services for the consecration of the new building on Sunday, February 11, 1973. The First Wayne Street United Methodist Church chose to remain a downtown church and to build an architecturally striking edifice at the heart of the city, dedicated to serving Christ. Four bronze bells, cast in Holland, were hung in the prominent church tower. The faceted stained glass windows remain outstanding features of the building. Those on the south present key scenes from the creation of the world to Christ’s resurrection. The west windows portray the Holy Spirit’s work in the formation and shaping of the Christ’s church, showing such varied scenes as the stoning of Stephen, Luther’s nailing the ninety-five theses to the door of the Wittenberg Castle Church, Francis Asbury as a circuit rider, and, finally, clasped brown and white hands symbolizing the Methodist unification of 1939. In 1974, a magnificent organ, build by Rudolph Von Beckerath of Hamburg, Germany, was installed. For the past 175 years there have been persons in this congregation who sought God’s vision for this church. The finger of God reached out and touched their hearts and minds. They responded to that spark of divine power… This congregation has had a glorious past. We celebrate it today. But we must do more than look to the past. We must also celebrate the future… We are the saints God has chosen to shape the future of First Wayne Street United Methodist Church. Christ needs the church, to live and tell his story, to praise his love and marvel at his trust, Till, bathed in light, awakened from the dust, We walk with God, alive in grace and glory. 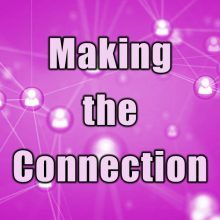 We are a cosmopolitan downtown congregation drawing membership from the greater Fort Wayne Metropolitan Area. 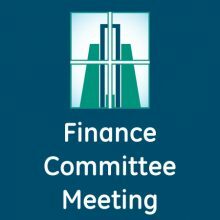 Our members and constituents comprise a rich tapestry in theological perspective, culture, education, occupation, and socio-economic background. 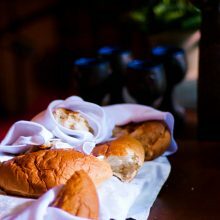 We honor our rich Wesleyan Heritage with serious, yet open theological reflection. Our mission is to develop disciples of Jesus Christ for the transformation of the world. 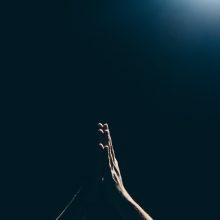 Music has always been central to the worship of God and First Wayne Street United Methodist Church considers it a privilege to offer the Lord the very best in harmony and praise. Our Future: uplifting. inspiring. downtown. Our vision for the future of First Wayne Street United Methodist Church is that God is calling us to remain a vibrant congregation, sharing the good news of God’s love in Jesus Christ at the heart of the city; transforming the hearts and minds of people; and preparing each Christian for an active role in God’s Kingdom.